Editor’s note: Special thanks to Leslee Harrington for sharing her story of hope with us! My son James was born November 13, 2014 at 39 weeks. He was a planned Cesarean since he was breech. I like to joke and say he was literally stubborn before he was born! From the beginning we struggled with nursing. He never had a strong latch and nursing sessions ended with both of us crying. When he was a week old, I decided to exclusively pump. When he was around 3 weeks old we saw a change in his personality and eating habits. He went from 4 ounces of breastmilk every 2-3 hours to 2 ounces of breastmilk ever 4-5 hours and seemed to spit up everything he ate. He started crying a lot more. It wasn’t your usual crying, it was a blood curdling “I’m in pain” cry. At this point in the game, the doctor told me to go off all dairy and add reflux medicine. I did this and didn’t see much change. At 5 weeks, we were putting James in the tub and he pooped on the floor. At that moment we saw blood in his stool. The next day we took him to the pediatrician’s office and they ran some tests. That night we received the call that we should try to put him on nutramagin formula or I could put myself on a vegan diet. At this point I was very emotional. They told us it would take two weeks for everything to get out of my system and an additional two weeks after that to get out of his. We chose to switch him to formula because it would be quicker for his healing. I was desperate for my baby to be better and to actually be able to enjoy this newborn stage. He initially did better on nutramagin and then he went back downhill. We were then referred to a GI specialist who put him on elecare. This was a lifesaver for his digestive issues – we saw a dramatic change in his reflux issues. At this point we knew James couldn’t digest milk protein. However, this did not change the crying very much. He needed to be held all the time. Moms shouldn’t be happy to leave their babies and go to work, but I was. It was a relief to get away from the crying, and I will always feel guilty for that. It was also a relief for my mom when I got off work because she got an escape from the crying. She had to just hold him all day. He was such a needy baby and that first year holds few happy memories for us. Sleeping was also a challenge for us. James started sleeping through the night at 3.5 months old. That did not last long, however. At 6 months he decided it was no longer for him. He began waking every 4 hours, then every 3 hours. It eventually got to the point where he was waking up every 45 minutes. Moms would tell me, “Oh, he has his days and nights confused.” No, my child simply did not require lot of sleep! He would sleep a total of 4 hours at night and take maybe 3-20 minute naps during the day. I was the definition of a “mombie”. It was a low place for me. But at 16 months, our world began to flip. James started sleeping well. We’ve had a few regressions, but we have dealt with it because nothing was as bad as that first year. He eats very well. He outgrew his milk allergy and now is only allergic to eggs. He loves to give kisses and hugs. He loves to play with his friends at daycare. He takes a two hour nap everyday and his teacher tells me he is the best sleeper in the class. He’s still very stubborn and independent, but I’ve learned to accept that and adapt my life around it. I’ve had to let go of some of the control I wanted over him and realize he is his own person. He has a HUGE personality and charms everyone who meets him. Year one and year two were polar opposites. There is hope. And my other friends comment, saying things like, “I’m sure he would have at 3 months old”, or, “You just never did it so you don’t know.” People who don’t go through these kinds of challenges just don’t know. But I wouldn’t trade my sweet baby James for all the unicorn babies in the world. We went through the darkest of times together, but now he’s the light in our world. It gets better mamas. 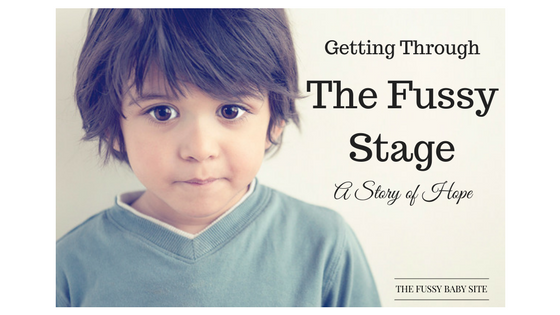 Wondering how you’re going to survive your fussy baby or toddler? 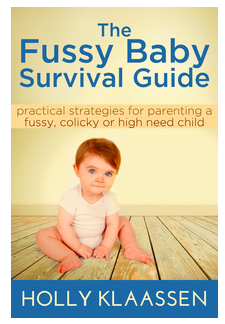 The Fussy Baby Survival Guide (ebook) provides practical strategies for soothing and coping with your fussy, colicky or high need child. After 10 years of running The Fussy Baby, speaking with most of the leading experts in the field, and running Facebook support groups with over 20,000 members, I’m confident you’ll find unique insights and techniques in this book!